UrbanOutfitters.com is an online version of the physical store, selling hip and kitchy merchandise ranging from clothing to household products. The page has a hip, young look with bright colors and a slideshow on the front page displaying the newest items and promotions. The page has a vibrant look and links to the different categories within the store website. The design includes a search box, and links to both your personal account and shopping bag. 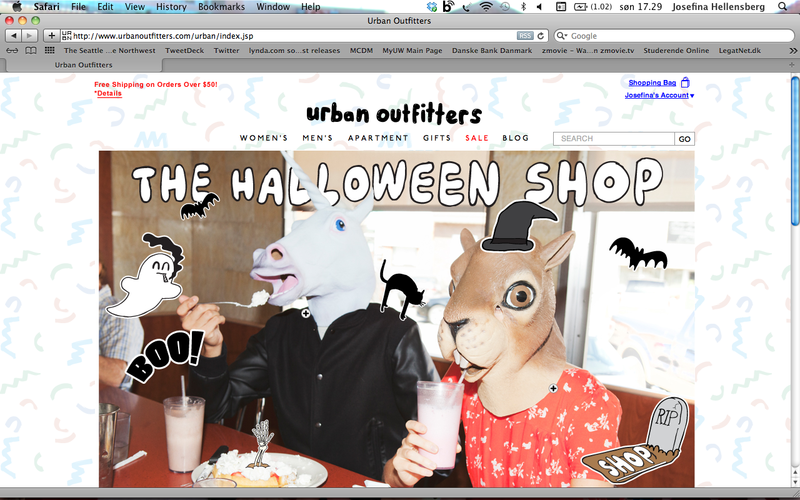 Urban Outfitters sell hip merchandise, and caters to a young audience. Their audience can be described as ”hipsters”, and would typically be 20-30 year-olds. Generate revenue from sales through their site. The site features many social media platforms, and allows visitors to follow Urban Outfitters on Pinterest, Facebook, Twitter, tumbl, vimeo, youtube, and spotify. The site also allows visitors to sign up for e-mails and daily updates (RSS). Visitors also have the opportunity to engage in live chats with Urban Outfitters.